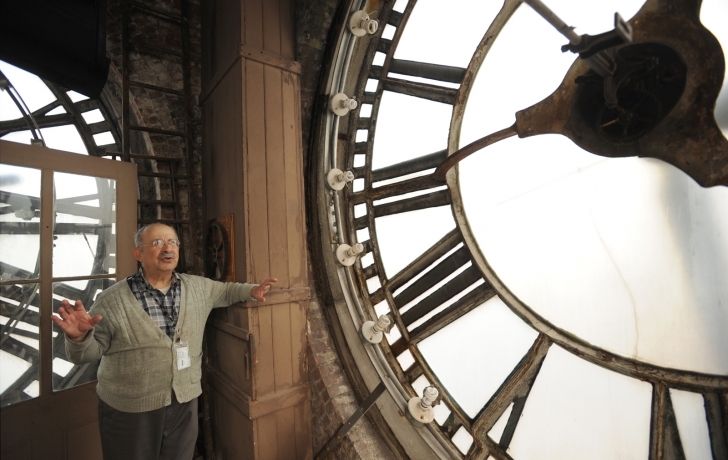 Is Time Running Out for Famed Clock of Tribeca's Clock Tower Building? Every Tuesday morning, almost like clockwork you might say, Marvin Schneider and Forest Markowitz wend their way up the spiral stairs inside the tower atop 346 Broadway. Climbing through the eerie darkness of the pendulum room, they enter a chamber all but untouched by modern technology or time. 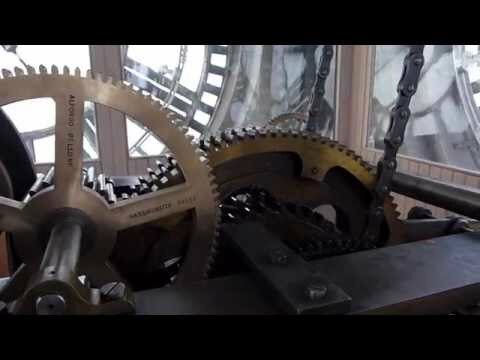 Sunlight filters through the tower’s four translucent clock-faced walls, illuminating a rare, 117-year-old mechanism that keeps ticking, thanks to the meticulous care by these two men. It's work that Schneider, the city's official Clock Master and a retired supervisor in the Dept. of Human Resources, has been performing since 1980, following a year-long volunteer effort to revive the neglected, broken down timepiece. For the first time in 20 lifeless years, the gears turned again, 2,600 pounds of weights were set in motion and the clock chimed on the hour. Joined in 1992 by Markowitz, a retired senior director in the city’s Health and Hospitals Corp., the pair have wound, oiled, inspected, reset and otherwise preserved the 1897 E. Howard Watch and Clock Company’s No. 4 Striking Tower Clock as one of the few still-functioning tower clocks of its kind. For how much longer, time will tell. As part of a proposed restoration and condominium conversion plan for the landmark building by the Peebles Corp. and El Ad Group, who purchased the landmark building from the city in May, the clock and its tower will be privately owned by the buyers of a proposed four-level penthouse. While the developers say they plan to keep the clock, which along with its mechanisms are protected city landmarks, it is unclear whether, or even how, it will continue to run once it is inside someone’s home. Along with landmark designated offices on the second floor that will also be turned into residences, it will have the unusual distinction of being a privately owned but publicly protected historic landmark. Schneider, Markowitz and other clock preservations, have formed an advocacy group called Clock Tower Associates. They say the clock and its workings are a public trust, soon to be lost. "How would someone get up here?" asked Schneider, who along with Markowitz have been taking care of the clock as unpaid volunteers since the city sold the building. "They've got to provide access to getting up to the clock machinery." The question was raised this month following architect John Beyer’s presentation on the building's extensive conversion plan to Community Board 1's Landmarks Committee. "We don't have any specific plans at the moment," replied Haim Hershkovitz, El Ad's vice president of construction. Nor, apparently, do they have to. Even if the clock can continue to show the time, more questionable still is whether the future penthouse owners will want to hear the bell chime hourly each night, above their heads. The clock stopped ringing in May, Schneider and Markowitz said, after the developers bought the building and cut power to the clock tower. Now the 97-year-old motor can't wind the clock or raise the 1,600 pounds of weights that allow the bell to chime for eight days as the weights descend. The manual winding of the bell-ringing weights is an arduous task that the men must forgo except for an occasional few twists of a mechanism that enables the bell to ring for a few hours. For the first time since the city’s blackout of 2003, Markowitz, 64, and Schneider, 75, must wind the clock manually to keep it telling time. “I don’t have to go to the gym today,” an out-of-breath but smiling Markowitz, said during one of his frequent breaks in the 20-minute-long hand cranking process. Schneider and Markowitz said they were told by a construction manager in the building that an electric line could be run up to the tower, but nothing has come of it. Then again, they said they have been cautious about pursuing it. In fact, the men have had little contact with the developers. Schneider recalled being brought into a meeting with El Ad Group executives in their midtown office soon after the building changed hands. He thought he would be negotiating a service agreement with the new owners. R. Donohue Peebles, president of the Peebles Corp., did not respond to a call requesting comment. According to the developers’ proposal to the Landmarks Commission, which is scheduled to be heard on Nov. 18, there is no plan to move the clock mechanism. But that hardly comforts its supporters. “Of the few remaining public timepieces of lower Manhattan that have helped to schedule the lives of New Yorkers over the past several centuries, the enormous clock on top of the 346 Broadway is by far the most important,” he said in an email. Schneider recalled putting it differently to the El Ad executives as he left their meeting.